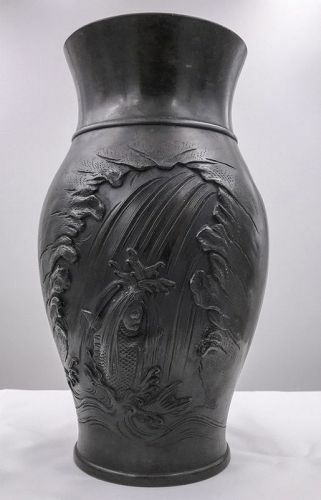 Large cast bronze vase with a Koi fish swimming up a waterfall. Please refer to our stock # 145 when inquiring. This beautiful vase depicts the late Han Dynasty myth of the koi (carp) fish that succeeds in climbing the rapids of the Yellow River in China. This myth, that carries over into Japan states the fish became a golden dragon. The saying in Japanese is “koi no taki-nobori” (“koi climbing the rapids”). The carp, conjuring images of energy, power and courage, is a worthy symbol for overcoming life’s difficulties and triumphing. The vase is particularly well crafted and proudly signed by its maker. Age: Meiji period, late 1800’s. Size 11 ¾ inches high by about 7 inches wide at the widest point. Condition: Shallow 1-inch dent to one side (as pictured). Otherwise excellent condition as pictured. Please see my store page for sales policy and other information.